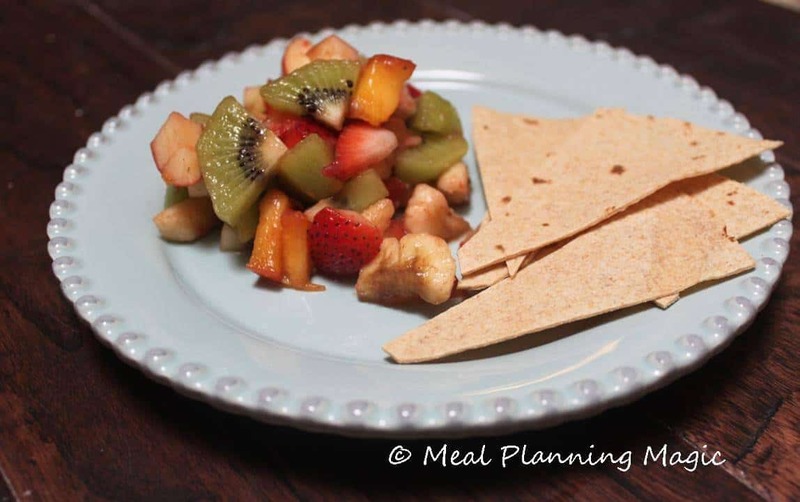 Fruity kiwi salsa is an easy-to-make fruit salsa, delicious for serving as a snack or on top of grilled chicken or fish. This easy homemade salsa recipe is quick to make, too! OK, so as you’ll see, this easy fruit salsa recipe has a lot more than just kiwi in it, but since this IS the Eating the Alphabet Challenge, I had to feature it in the title since this month’s challenge is for the letters K & L. But as you’ll see, it takes advantage of many different fruits, including one of our summer favorites, kiwi fruit. Kiwis are one fruit my whole family has loved for as long as I can remember. Kiwi is packed with phytonutrients and antioxidants and has more vitamin C than an equivalent amount of orange! We love to eat them plain—just peeled and sliced. Or chopped on top of a granola yogurt parfait. So for this month’s theme, it only seemed natural that we chose kiwi. When choosing a kiwi, it should be soft and yield to gentle pressure but a mushy kiwi is overripe. It can be left to ripen on the kitchen counter but once it’s ripe, you can store it in the refrigerator for up to two weeks. Kiwis from New Zealand are available in the spring and summer months while kiwis from California are available the remaining months of the year, making this fruit available in most grocery stores year round. While we love fresh fruit in just about any form, I have discovered that my family gobbles up a whole lot more of the fruit rainbow when I have it combined in a fruity salad or salsa. My family had a discussion about the different and I decided it was really just a matter of how small you chop the fruit and how you serve it—with a fork, spoon or edible vehicle like a baked tortilla chip. I think this would even be delicious as healthy vanilla ice cream topping. This kiwi salsa is SO easy to put together—Just chop up the fruits in less than ten minutes. Then, add the lemon juice and cinnamon to jazz it up a bit. Here’s the kiwi salsa recipe so you can try it, too! 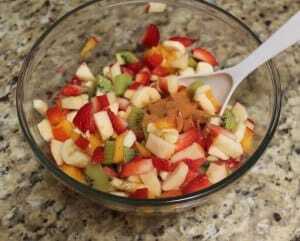 In a medium bowl, mix together all fruits. Add lemon juice and cinnamon and stir to combine. Ready to serve! Aren’t all the colors just gorgeous? Talk about eating a rainbow! Everything’s chopped and cinnamon & lemon juice is added–just ready to stir and serve! 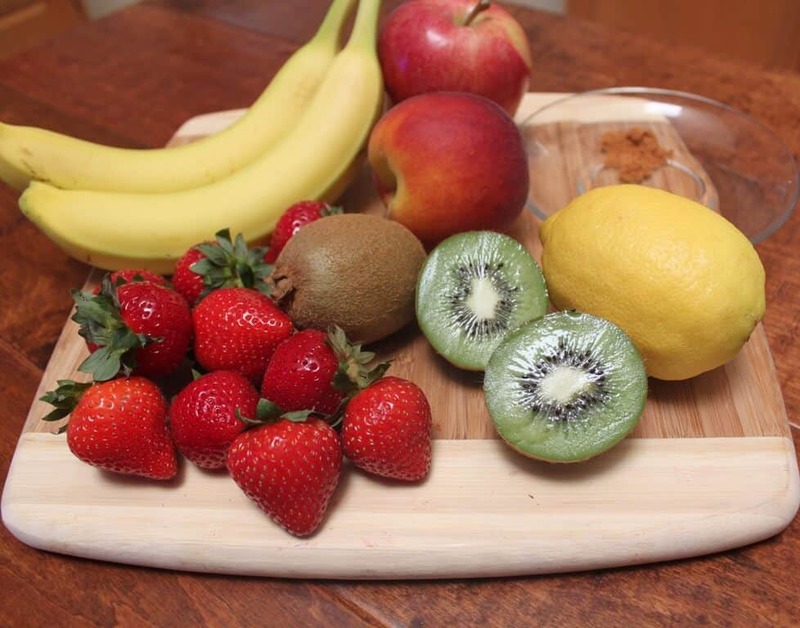 So, what’s your family’s favorite fruit or vegetable that starts with the letter K or L? Please share with us in the comments below! Bloggers, I’d love for you to join our Eating the Alphabet Challenge. Follow us on Twitter too using the hashtag #EatingAtoZChallenge. Click here for details and to complete the form to sign up. And be sure to check out all these other fabulous blogger’s interpretations of the letter K & L—fruit, veggie or grain-style–this month by visiting the blogs below! I know I’m planning to try a few.